Little girls love to dress up like twins… especially with their mom! Shop this collection of mother daughter matching pajamas to give your daughter (or even your mother!) a nice surprise for Mother’s Day, Christmas, or any other time. She will be thrilled when she opens the package. 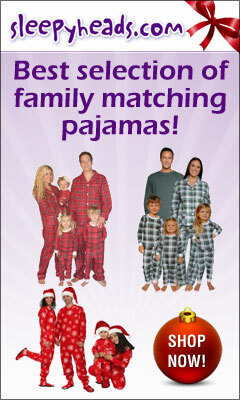 There are many styles and patterns of PJs available for all personalities and preferences. Strengthen your bond with your mother or daughter with these adorable matching sleepwear sets. If you are looking for matching pajamas for mom and baby or newborn baby instead of a young child, view mom and baby matching pajamas instead as it will have more appropriate pajamas for you. In addition to finding the most-popular matching pajamas on the web, we’ve also complied a list of special offers and coupon codes around the web! 5% off any size order at SleepyHeads.com. Use 5OFFPJS at checkout. Free Shipping at SleepyHeads.com with orders $79+. Use FREESHIP at checkout. This two piece Mommy & Me pajama set is made from 95% cotton and 5% spandex making for a comfortable fit. It’s fully piped and has a well-fitting elastic waste. Mom’s pajamas have a scoop neck top. The pattern is wintery yet also girly which means it will be loved by all women, young and old! These mother daughter matching pjs are perfect for all seasons! The pattern is a fun, hot air balloon print on a pink background and is just beautiful. The materials is 95% cotton and 5% spandex which allows them to maintain their flattering shape. The little girls pajamas are piped with hot pink fabric around the neck, wrists and ankles. A great choice for mom and daughter! These SleepytimePJs are perfect for a mother and her daughters. Made from 100% cotton, these pajamas are available for infants, kids and adults. Many sizes in each category are available. The pattern of these pajamas are white with black floral print. Great summer evenings pajamas! Great New Baby and New Mom Gift Idea – Every mother knows the best gift they ever received was her baby. Coordinating BEST. MOM. EVER. tee and Polka Dot pant set with BEST. GIFT. EVER. baby onesie is a fantastic new mom gift. Featuring a fun floral print, these are the perfect pajamas to send to Mom and all of her wild ones! Pajamas are 100% floral print and tops are pink for the moms. Pajamas run from infant, to kid, to adult. These pajamas are Snugglenado’s absolute favorite! These are such a cute gift to give a Mommy and her daughters. Sizes run from infant, to kid, to adult for everyone. Infants get cute little onesie pajamas! The pattern is a powder blue with pink and white flowers, this will look just darling on all of the girls! This pajama set is just darling! With wild pink and blue chevrons, you can find a comfy set of pjs for your daughter and for yourself too! For adults, this set is available in both pants, shorts and even a nightie. Little girls get a matching top and shorts, and infants get a little onesie. All kids pajamas come with a matching doll nightgown. How perfect! This set is lovely with light blue chevrons and a contrasting mermaid print for little girls! Mom gets her choice of shorts, capris or a nightie, and little girls get a short/top set or a onesie, depending on their age and size. All kids pajamas come with a matching doll nightgown, too. These flower power pjs are perfect for summer. Kids pajamas are 100% cotton and come with a matching nightie for an 18″ doll. Mom gets the choice of a shirt/capri set or a cute little nightie. We love this set! More cute matching pajamas from SleepytimePJs! Surprise Mom with these adorable pajamas for her and her daughters. Sizes range from infant to adult. Infants get cute little onesie pajamas while toddlers and kids get a two piece set. Made from 100% cotton, these pajamas are the perfect blend of comfort and style. The pattern is white white a blue and pink floral print. Gifts for mother and daughter – Every mother knows the best gift they ever received was her baby. Coordinating BEST. MOM. EVER. tee and boxer set with BEST. GIFT. EVER. baby onesie is a fantastic new mom gift. Love Your Family Heart Pink ‘Bubblegum’ Mother-Daughter sets for ladies and girls matching sets are comfortable and adorable. Perfect gift for mothers, daughters, sisters, grandmothers, the whole family to enjoy quality time together. These beautiful mommy and me pjs read “I dream in black and white” and features pandas! The tops are a solid black and the bottoms are pink with panda faces on them. The material is 100% cotton. Mom’s top is tapered at the waste for a form-fitting fit without being tight. The girls top and bottoms have elastic cuffs around the ankles and wrists.